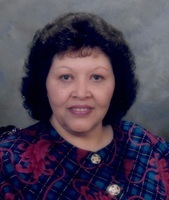 Provide comfort for the family of Juanita Russell with a meaningful gesture of sympathy. Juanita Russell, age 79 of Chesterfield, NJ went home to be with the Lord December 17, 2018. She was born June 24, 1939 in Rio Piedras, Puerto Rico, the daughter of the late Ramon Santana and step mother Delia Santana. Juanita was the beloved and most cherished wife for more than 55 years of LtCol, USAF (Ret) Raymond B. Russell, Jr., and the treasured loved mother to son Raymond S. Russell and his wife Elizabeth and her daughter Lillian F. Robertson and her husband Darryl. She is also survived by sisters, Milagros Muniz and Rafela Guasp, brothers Jose“Papo” Santana and Jose “Monchito” Santana. Juanita served the country for a combined 70 years with a military father and wife of a military husband at many locations throughout the US and overseas. She devotedly served 22 years in the McGuire AFB, NJ Thrift Shop with several years as the Chairwoman Manager. She had a generous heart and enjoyed helping military families. She was an avid reader, a gourmet cook unsurpassed in Puerto Rican cuisine. She will be sorely missed, never forgotten and cherished in memory with love forever. A visitation will be held on Friday, December 28th from 8:00 to 9:00 AM immediately followed by the funeral service, both at the Mount Laurel Home for Funerals, 212 Ark Road, Mount Laurel, NJ. She will be laid to rest with a predeceased infant son in Beverly National Cemetery, NJ. Dear Colonel Russell & family: Those we love dont go away. They walk beside us every day. Unseen, unheard, but always near. Still loved, still missed and very dear. We are so sorry for your loss, Butch. You and your family are in our prayers. God Bless you all. Love Jim, Patty and the entire Gemberling family.